Marriage is outdated. You can’t deny that there is something wrong with an institution that carries a more than 50 percent failure rate. If a high school graduated less than 50 percent of their students, they would be shut down. If 50 percent of cars spontaneously crashed and burned, the industry would be out of business. The institution of marriage needs a makeover (especially for elected officials)—an extreme, bring-out-the industrial-strength-spackle-and-the-backhoe makeover. Oh, the allure of happily ever after is so enticing. I’m sure the cavewomen were all a tizzy when their intended would drag them by the hair back to their lair post-ceremony. But, that had to end. And so, too, must our outdated expectations for what marriage is. Listen, I’ve been down the marriage path. Heck, I even have a ‘left the guy at the altar a few months pre-wedding’ episode under my belt. It hasn’t worked for me. After years of trying to figure out why, I can come up with only one answer. Because I was trying to make “me” (oh right, and “him”) fit my perception of what marriage should be. My perception was wrong. Every marriage is different, because, let’s face it, every person is different. Marriage is not a fairytale. It is work. A labor of love. Don’t get me wrong. I want to believe in love everlasting. I love, love. After all, when I was little, I woke up at 5 a.m. to watch Lady Diana marry Prince Charles. And, when I was 37, I woke up at 5 a.m. to watch Kate marry Prince William. Back when plaid pants were fashion du jour, I used to sit in my childhood bedroom (that coincidentally donned plaid wallpaper), with my Fisher Price push-button phone, flipping through the JC Penney catalog’s bridal pages, planning weddings for fake couples, right down to the hideous teal satin dresses that their 14 attendants would wear. One could argue that planning a wedding was actually more alluring to me than getting married. You can only crash and burn so many times before you get smart. And so I did. I decided that I would never get married again, which by the way is extremely easy when you are dating dopes. Knowing that my expectations are extremely high, I modestly called a moratorium on marriage. And I stopped looking for perfect. And then… wouldn’t you know it? Girl meets boy. Girl and boy fall in love. Boy pops the question. Girl says yes and scoffs at all of the “when are you getting married” inquiries, because this time she is much wiser, 10 years wiser, in fact. And then it hits me. Do people get married because other people tell them they should? I mean these “other people” are downright relentless. No matter how many times you say, “I don’t know,” they come up with seven different ways to ask the same question. You are, in essence, forced to have a wedding—and were probably forced to get engaged in the first place. Just because people (who are these people anyway?) 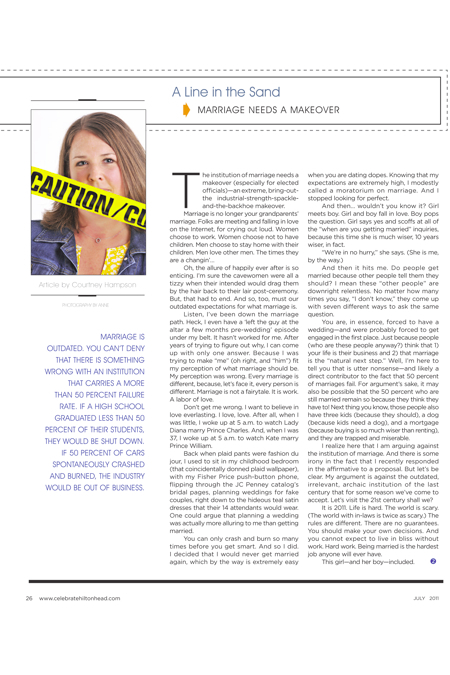 think that 1) your life is their business and 2) that marriage is the “natural next step.” Well, I’m here to tell you that is utter nonsense—and likely a direct contributor to the fact that 50 percent of marriages fail. For argument’s sake, it may also be possible that the 50 percent who are still married remain so because they think they have to! Next thing you know, those people also have three kids (because they should), a dog (because kids need a dog), and a mortgage (because buying is so much wiser than renting), and they are trapped and miserable. I realize here that I am arguing against the institution of marriage. And there is some irony in the fact that I recently responded in the affirmative to a proposal. But let’s be clear. My argument is against the outdated, irrelevant, archaic institution of the last century that for some reason we’ve come to accept. Let’s visit the 21st century shall we? It is 2011. Life is hard. The world is scary. (The world with in-laws is twice as scary.) The rules are different. There are no guarantees. You should make your own decisions. And you cannot expect to live in bliss without work. Hard work. Being married is the hardest job anyone will ever have.